On Wednesday 28th March we had booked Brands Hatch for a shake down, but with all the issues that we’d been having with the car, we weren’t sure if we were going to be able to get the car out on track. And, as with most things that we do, it was all last minute. At midday, the car was back together, but we were anxious to see whether it was ready, so we decided to give it a go and headed off to Brands. 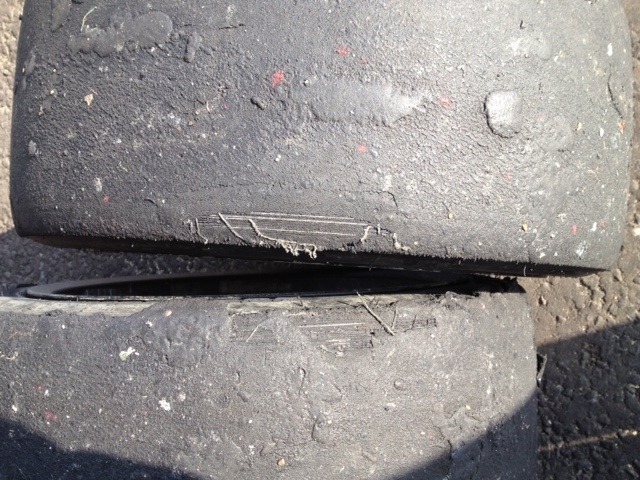 We managed just 3 laps as the over-heating problem that we experienced on Media day had re-occurred. We therefore, packed up and went home. I then called Matt Neal to go through the issues and within 20 minutes I received a call from Neil Brown (who built the engine) asking us to take the engine back to him. 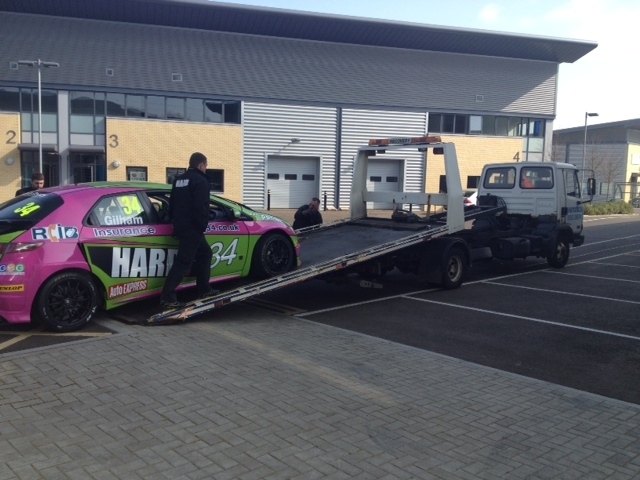 Our chief engineer, Dave “The Reverend” Peace and senior mechanic Phil Boase then set about taking it out of the car. By 10pm it was out and loaded on to our van in readiness for the 120 mile trip up to Lincolnshire. Peacey, or the Reverend as he is affectionately known within the team, arrived at Neil Brown Engineering by 6am on Thursday morning and spent the day with their engineers whilst they tried to rectify the problem. Peacey (The Reverend) arrived back at our premises at 6pm on Thursday evening where he and Ryan Stewart worked until 2am on Friday morning in order to get the engine back in to the race car. The race transporter was all loaded up, minus the car and headed off to Brands as we had to be parked up behind our garage by five past five. On Friday morning at 6:30, the team gathered at our premises in order to leave for Brands Hatch so that we could set up for the first round. That was all except Peacey and Ryan as they still had a few things to do on the car, so that arrived at Brands at around 10:30 courtesy of Scott Lilley from Autotech, whom I have to say, did a fantastic job of painting our race car. It was a bit chilly in the morning, but it warmed up as the day went on, but the team set about dressing the garage in readiness for the weekend. At 5:30, we had a 15 minute slot to go out on track. As I headed out with 8 minutes left, one of the other cars went off track which meant a red flag. So I didn’t even get to complete a lap! Some of the boys worked on the car later in the day and following on from a team meeting at 7pm, at around 8pm we all tucked in to a Pizza meal that we had delivered to the track. This was the first opportunity that we had to sit down as a team. By the time we had all left our local track and gone home, we climbed into bed around midnight. We had arranged to meet at the circuit at 7am in readiness for another long day ahead. I had to sign on between 8:30-9am which was followed by a drivers briefing and Team Managers meeting which Gary and I had to attend. By 9:15 the team were focussing on Free practice one which was at 10am. This didn’t go well at all as I only managed 1 lap due to an issue with my gearbox as I couldn’t change down the box. This was now the start of what became a busy weekend working relationship with representatives from both Neil Brown Engineering and Team Dynamics as we had a very problematic first weekend. Free practice 2, some two hours later was better in that I managed to complete 20 laps, but we were still having issues with the car. Still struggling with gears on the way down the box and also not centralising. At 20 past 3 we were out for the start of the season’s first qualifying session. On lap 14 of the 18 that I managed to complete, I set my fastest time of 50.617, some 2 seconds off of pole and 20th place on the grid. Not good, but we knew that we could find the time if only we could get the car right. It was a case of just bedding in the tyres hoping we could get it ready for race 1 which in effect would be our 1st test of the new car having done no fast lap running at all. Again, the boys set about getting the car ready and finally called it a day around 11pm. Another early start in readiness for the day ahead. Again it was a bit of a chilly start to the day, but the tea urn was on and the sausages and bacon were cooking, so at least the team had something warm to keep them going! At 9:10 the gates opened for Pit Lane Walkabout. The day had now started as the sun began to break through the clouds in time for the fans arriving in the pits. We were all set. Being our local track, it was nice to see a lot of familiar faces amongst the crowd. At 11:35 Pit Lane opened for round 1. I was in the car and the team were ready. A quick radio check and alignment of my mirrors, before I was off for the mandatory 2 green flag laps. The car was severely bashed about, so much so that I couldn’t open my door when I arrived back at our garage. Scott had to prise the door open and immediately the team began rebuilding it, including a new piece of glass in the passenger door window. The laptop also came out as we were still suffering with boost pressure and engine fuelling related problems. Race 2 was some two and a half hours away, but we needed every minute in order to ensure that we were out for it. Still suffering with lack of boost and throttle hesitancy, we managed to get up to 12th before I had to take evasive action in order to avoid the car in front, which relegated me to 18th before finally finishing in 13th of the 21 cars that started the race. The team were very upbeat for Race 3 as we were starting on Row 7 of the grid. However, with less than 5 minutes before we were due out for the formation lap, we had a fuel leak and Peacey had to get down to Team Dynamics garage in order to get a replacement, get back and fit it. Otherwise, we would have to join the back of the grid. Along with both Ryan and Phil, they managed to get me out with just 3 seconds remaining. The car was feeling better, but after a car dropping oil all over the track on lap 7, I was one of 7 cars that went off, causing a red flag. However, as the marshals managed to push me out, it meant that I could get back to the pits for a quick inspection although nobody was allowed to touch the car. With no real damage, I was allowed to join the back of the grid, eventually finishing 10th of the 22 cars that started the race. Though after closer inspection of the tyres we found some severe flat spots with metal and thread hanging out of both front tyres which clears up the handling issue developed after the trip in the gravel. The team did a tremendous job over the weekend. For many, it was the first time they had met and although we had early starts and late finishes, they all got on very well and a strong bond was formed. The girls in the hospitality suite worked really hard too and our sponsors and their guests all said that they had a great day and from the footage that I have seen on somebody’s phone, it looks like we have some new fans. On Monday, it was back to work for all, but first on the agenda was to unload the truck, full strip and check over the race car. Peacey and Ryan took the engine out to go back for dyno testing and at 3:30 Ryan set off for Lincolnshire in order to rectify our problems and improve performance for Donington. The start of the 2012 BTCC season was always a date in the distance, but since collecting our new car a few weeks ago, it seems like time has just flown by. We had booked some dates in for testing as I needed to get out in the car for some much needed time in order to get used to it. I had to cancel one due to the car not being ready and the second at Brands Hatch some 4 days prior to media day lasted just 10 laps due to an over-heating problem. With not much time to rectify the problem, it was time to head off to Silverstone for Media day on Monday 19th March. There was a lot of running around over the weekend with us eventually leaving Dartford around 4pm. We arrived at Silverstone around 6:30 so had to sit and wait in the car park until we were allowed in at 7pm in order to park up. As it had been a long day, we decided to leave the unloading of the truck until the morning when the whole team would be present and more importantly, we were all starving. We therefore headed off and checked into our hotel, where we were met by one of our VW Cup drivers, Richard Kingsnorth. After a quick freshen up we were off to the local Harvester for a beer and something to eat. We then went back to the hotel, where I headed off to bed and left the rest of the team to relax in the bar, including two of our other VW Cup drivers, Lucy Ramsden and Andy Wilmot. Some of them relaxed until 1am! At 6:30am on Monday, we were checking out of the hotel and heading off to Silverstone in order to prepare for the day ahead. We had a lot of guests there on the day including family, friends & sponsors. Apart from the car issues, we had a good day. Tony Gilham has revealed he’ll race a turbocharged Honda Civic in 2012’s Dunlop MSA British Touring Car Championship. 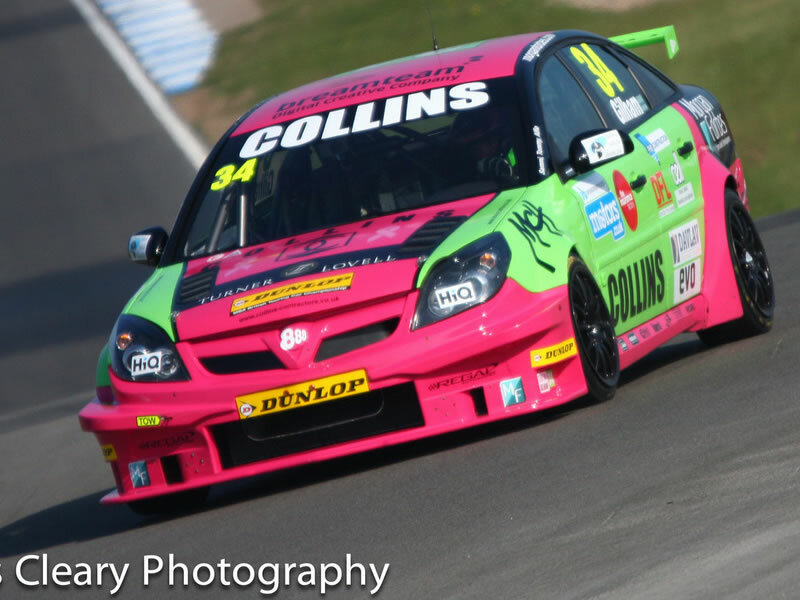 Gilham has acquired the ex-Dynamics Honda Racing Civic driven to six race wins and runners-up spot in 2011’s BTCC by Gordon Shedden. It will continue to use a potent Neil Brown-tuned Honda turbo engine this season, although Gilham is remaining tight-lipped about which team will run the car. 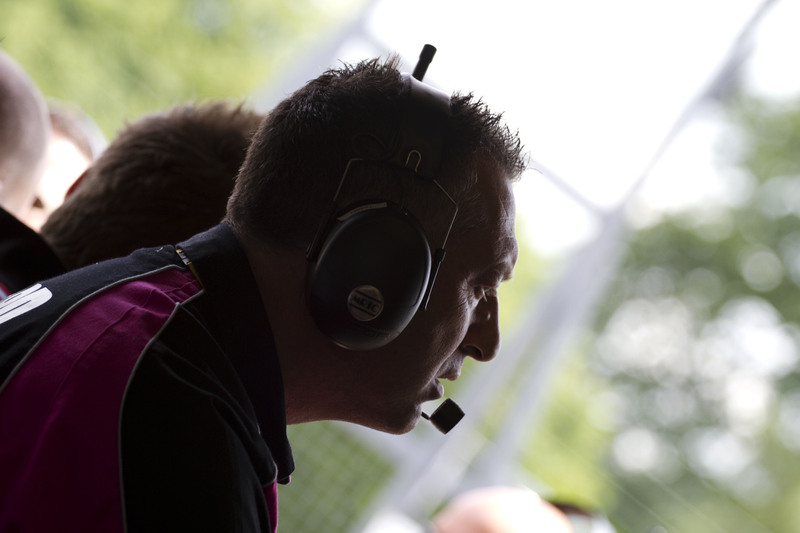 Dartford racer Gilham was a popular addition to the BTCC grid last year and impressed many with a string of outright top ten points finishes in his first few events. The 32-year-old clearly hopes to build on the lessons learnt in his debut season and told btcc.net: “Obviously I’m massively excited to have got my hands on one of the title-winning Hondas. Last year was a huge learning curve for me with a number of low points, but now I’ll be in a proven car and can’t wait to get going.